The Giants needed to prove they could compete with the defending World Series Champs, a likely Division Series opponent come October. Barry Zito and Jonathan Sanchez needed to prove they could contribute in a major way down the stretch. On the 50th anniversary of Willie McCovey’s major league debut, Sandoval took his place in Giants lore with the 49th Splash Hit into the cove named after the wildly popular first bagger — whose retirement was announced to the crowd at my first live game in 1981. They didn’t show a replay of Manuel’s reaction on TV, but I’d love to imagine him accidentally swallowing his gum when Panda made contact. Meanwhile, Sanchez allowed a first inning run and later shared a little drama with Chase Utley before the All-Star second baseman took him deep. 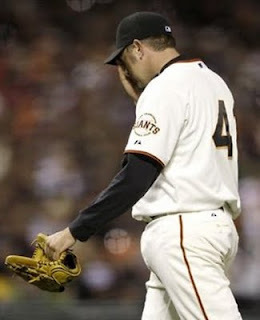 But on the whole, he turned in a strikingly solid performance over 5 2/3 innings. In the process, Sanchy improved to 4-1 with a 3.26 ERA at 24 Willie Mays Plaza, compared to 0-8 and 6.33 on the road. If he can find a way to get it done in the bottom halves of innings, we might finally see the full package from the most intriguing — and frustrating — arm in the organization. A quick aside is due to one Eugenio Velez, who stayed hot as a Saharan summer with three more hits and three more RBIs to pad his constantly improving stat line. He and Panda combined to drive in all seven of the Giants’ runs. If this keeps up, my man crush Nate Schierholtz might find playing time hard to come by when he returns from the DL. But let’s temper our enthusiasm with a dose of reality and remember that many a Giants farm hand has made a splash for a week or two. Sustained brilliance, however, has been harder to come by. When Jeremy Affeldt allows a run without getting anybody out, Kung Fu Panda goes 0-for-4 at home, and Merkin Valdez has the best night of any Giants reliever, you’re not going to win that game. Period. It didn’t help that the G-Men were opposing reigning AL Cy Young winner Cliff Lee in his debut with a new team. He was out to make an impression. 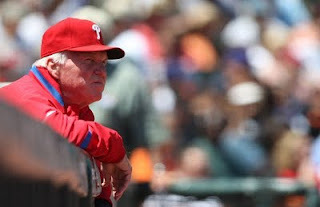 I imagine a complete game victory should win him some fans in the City of Brotherly Love. 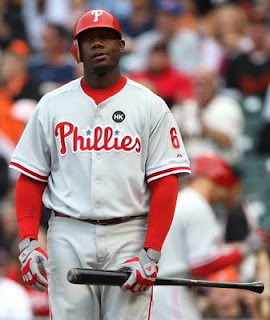 I’m sure his prowess with the bat didn’t hurt either. While it wasn’t his worst start by a long shot, this may have marked the end of Ryan “The Big” Sadowski’s run in the Show. Perhaps it was just a coincidence that his shoulder acted up in the middle of his fourth loss in as many starts since his whirlwind debut, but it’s just as well. He’s pitched four or less innings in his last three starts, and sure enough, he was banished to Fresno on Saturday morning. As of now, it’s anybody’s guess who gets the start Wednesday in Houston. My money’s on Joe Martinez, but I’ll admit, it’s a sentimental bet. I’d love to see that kid get a chance to be a part of this playoff hunt after all he’s been through and knowing how much love the other guys in the clubhouse have for him. As of all reports, rushing MadBum from AA Connecticut is not an option. "It's a little uncomfortable, but you play through uncomfortable things. I played with blood in my brain. I'm not worried at this point." - Ryan Sadowski on his achy shoulder. Sadowski suffered a subdural hematoma in the minor leagues. What else can you say? 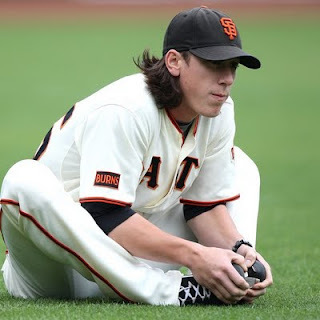 Even when he doesn’t have his A-game, Tim Lincecum still manages to appear dominant. This time, it was against one of the most potent offenses in the Majors. 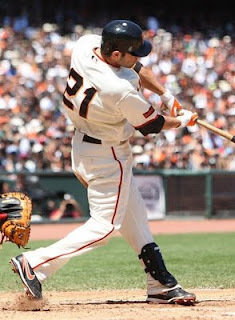 The Freak also struck out eight to increase his Major League-leading total to 191. He’s fanned eight or more in his past 10 starts. That, my friends, is consistency. The changeup he developed last year has turned into his strongest out pitch and could be credited with turning a great pitcher into a legend. Three cheers for Tim Flannery and his balls of brass for sending Aaron Rowand on Juan Uribe’s shallow fly ball in the fifth. A smart third base coach can win you a game or two over the course of a season, and with Timmy on deck and two outs, this move put Flannery’s game knowledge on full display. On the way down the ramp as Tony Bennett serenaded the seagulls, fans spontaneously erupted in chants of “Let’s go Giants!” I haven’t felt this kind of energy at the park since the 2002 playoffs. This is exactly what I was talking about when the team returned from Colorado. Keep it up, everybody. Btw, the Giants registered their 10th home sellout of the season with a paid crowd of 42,694. I have to imagine the Dog Days promotion didn’t have as much to do with that as the Lincecum strikeout deal. But I doubt management is happier with more butts in the seats since many of them got $15 bucks off their duckets thanks to Timmy’s career high 15 Ks Monday night against the Bucs. Lincecum improved his career record to a 37-13. Tim Hudson (38-12 with the A’s) is the only active Major League pitcher with a better record through his first 50 decisions. Can you imagine where this kid would be if he had a decent offense to support him? Rowand played through pain after taking another pitch to another elbow on a high hard one from Joe Blanton on Saturday night. With results like this, I kinda wish the guy was hurting all the time. Of course, that didn’t work out so well last year. 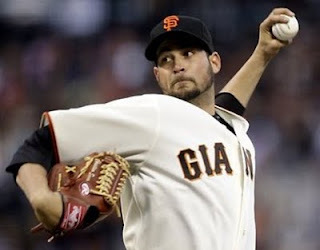 Meanwhile, Freddy Sanchez was almost the goat in his Giants debut after an ill-advised throw allowed the go-ahead run to score in the fourth. But he made his blunder into an afterthought with this blast that made the yard shake and propelled us to a crucial victory. Only in baseball can one witness such a fascinating turn of events. Haters should take note that Zito now has as many victories this season as his Sunday opponent and 2008 World Series MVP Cole Hamels. The Giants finished the homestand with a 6-1 record and a 1.55 ERA overall, which includes a 1.14 mark for the starting staff (with Cain making only one appearance). The Orange and Black improved to 37-16 at the Cove, the best home mark in the majors. With 28 games remaining in the City, they’ve already matched their 2008 home victory total. As expected, this was definitely the series of the year. With the Hated Ones and Rockies continuing their torrid paces, the Giants needed to win, not split. If they end up reaching the postseason for the first time in six long years, I think we’ll look back at Sunday as one of the crucial victories that put them there. Allow me to take a moment to invoke an old baseball adage: Good pitching trumps good hitting. That was never more evident than over this weekend, when the Giants’ best-in-the-bigs staff collectively shut down the hottest offense in the league, holding them to 10 runs over four games. This should be all the evidence any October-bound team needs to deduce that they do not want to draw the Giants in a short series. After six years of hopelessness, our team inspires fear. Humm baby!